This year might not have been all that you want it to be. It’s possible that you are in one situation or you about to enter one. It’s possible that there are those you would have love to have around you in this season of celebrations but for one reason or another, they are either out of your life or they are far away. Among us are many that are hurting; many that are in silent hell in their marriages; many that are in their hospital beds and many that are not sure how they are going to pay their next bill. It can be hard to see past where you are right now but irrespective of your circumstances today and in whatever street of life you are, I want you to always remember that God is enough for you to triumph. His mercy and grace are the reason you are still here. He is bigger than any of your setbacks, His ability outshines your inabilities and He is able to do exceedingly, abundantly above and beyond what you could ever imagined, ask or think. Whatever it is that you’re believing God for, just hold on. Ephesians 3:20 (MSG) says, “God can do anything, you know – far more than you could ever imagine or guess or request in your wildest dreams! He does it not by pushing us around but by working within us, his Spirit deeply and gently within us”. I know a lot has happened to you, enough to erase your faith in Him but I am encouraging you to make room for Him to do something new. God is not condemning you, He is able to release everything that belongs to you once you open up to what He has to offer. God is the God of miracles. He is the creator of ALL things. He is not limited to man’s fears or lack. He cannot be contained. He is more than a provider. God is your everything. What God intended for you goes far beyond anything you can imagine. Don’t keep quiet in that situation, don’t settle for mediocrity when you have a God who is able to do anything. Go ahead and ASK! Go ahead and give your faith a TARGET. Let knowing that He that has called you is faithful and is able to do exceedingly, abundantly above ALL that you could ever ask, think or imagine be your daily inspiration to stand strong and keep pressing forward. The year 2016 might not have been all that you want it to be BUT never lose hope, hang on to God’s hand. Whatever it’s that you want exist, activate your faith for it. God is able to do the impossible. He is able to miraculously show up and show out. May God restore to you what you have lost. May God surprise you in these last few days of December 2016. 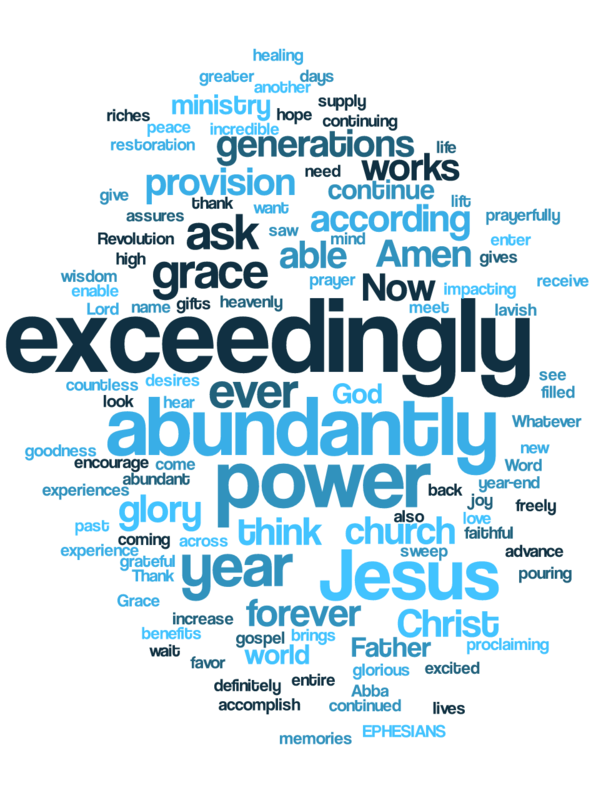 I pray that every desire of your heart be granted to you exceedingly abundantly above anything that you ask or think.